When I first performed this symphony, I was in the Greater Buffalo Youth Orchestra. I was 15, and it was like an initiation rite: now I too would be able to say I’d played “Eroica". The title was one of the attractions: Italian, exotic, even a little naughty if you think there might be supposed to be a “t” in the middle. I imagined I heard Boromir blowing his great horn in the 2nd movement. And of course there are the mythic stories about this symphony: Beethoven's tearing up its dedication to Napoleon in protest, the Boston Symphony’s last-minute performance of the Funeral March in the face of unthinkable tragedy. The second time I performed this symphony, I was an adult blogger on violinist.com. It was a whirlwind-quick festival over Christmas vacation, with a young, creative—heroic—conductor as the inspiration. I dusted off the old memories and was surprised and pleased at how well it all came back. The third time I performed this symphony . . . well, I haven’t gotten there yet. We have 3 more rehearsals, which, if you think about it, isn’t that many. Yet, I still feel like I’m the muddy middle of things. I’m doing okay with respect to getting basic rhythm, intonation, and dynamics, and with re-awakening the muscle memory, but I’m still . . . struggling. Back in my old orchestra, I was the concertmaster. I didn’t always mention that; in fact I usually just talked about “the orchestra I play in . . . “ unless it was a situation where I thought it would help me, or the orchestra, such as when I was dealing with publicity or finding a concert venue for orchestra-associated chamber groups. Then, I was the concertmaster, I was in charge, I was the one to deal with. I had the support of the conductor. I practiced my music, I tried my best to standardize the bowings, I served on the Board of Directors. I stood in front of the group and asked for the tuning A to start the concert. None of this stopped me from feeling like an impostor sometimes. Since I had never been to music school, since I had quit the violin twice, and since it was a non-audition volunteer group, I hadn’t earned the position the way most people do. I believe I did earn it over time, as a steady, conscientious presence who believed in and came to love the orchestra like a family. But I didn’t wear the mantle lightly, and sometimes I felt a little guilty enjoying it. After all those teenage years spent kicking around the back of county, state, and youth orchestras, and of turning the concertmaster’s pages in high school, a dream that I hadn’t even realized I’d been nurturing, came true in middle age. During my time as concertmaster, I thought I was appropriately deferential to the conductor, and appropriately considerate of suggestions from the rest of the section (and other sections). I was small-c-conservative and mostly stuck to the printed bowings and took passages “as it comes" unless I had a good reason to do otherwise. Once I figured out a bowing I stuck with it and played it the same way from rehearsal to rehearsal, again, unless I had a good reason to do otherwise, and then the change was announced. My leadership style, if I could be said to have one at all, was not in-your-face, not heroic. I didn’t have strong musical opinions because I really didn’t think I had the right to have them. Well, apparently, I was wrong about that and probably other things too. There’s nothing like the back of a first violin section to bring out the opinionatedness in all of us. For example, I have to admit, sheepishly, that I do not follow someone else’s bowings very well. For 7 years I’ve been used to doing what I want and expecting everyone else to follow me. And when I look up, I expect to see the conductor’s smiling face, not someone else’s bow going the opposite direction from mine. I find myself grumbling silently—up bow? There? WTF, are you kidding me? Oh, yeah, ok, that’s fine. Oops. I’ve been making liberal use of my pencil—and its eraser—in rehearsal. In Eroica, though, my opinionatedness seems to focus on something different: interpretation. I remember now that I did have a policy as concertmaster that was not universally loved. I always told my section to play chords divisi unless it was explicitly marked “non-div” or unless the conductor said otherwise. This started as a carryover from high school and youth orchestra days, but I still agree with it in principle. I think that symphonic chords, at least when played by a non-professional orchestra, sound better when played divisi: cleaner, better in tune, more together, and less crunchy. Playing chords divisi also works to prevent a phenomenon that I personally dislike (and here is my opinionatedness again rearing its ugly head): violinist showoffy-ness. But in the current performance, not only are we supposed to play all the chords non-divisi, but he’s having us do a lot of down-bow retakes, another technique that I prefer to use sparingly. I want to stop grumbling, even silently. I’m new here and I know it’s not my place to grumble. But I still don’t like the heaviness that these techniques bring to the piece. The concertmaster says it’s what Beethoven would have wanted, a reason I fully respect, if true. But is it true? How can we know? 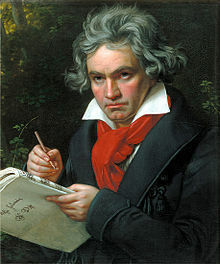 Beethoven’s Eroica might be the most talked- and written-about symphony in the history of classical music. I did a little internet research and I found a number of cool things that made writing this blog take a long time but didn’t answer my question: 1. The Eroica Riddle: Did Napoleon Remain Beethoven’s Hero? Beethoven’s taking away the dedication to Napoleon may have been motivated more by practical and financial reasons, than by democratic disillusionment with a self-proclaimed emperor. 2. Norman Bates listened to Eroica in the Hitchcock movie, “Psycho;” and 3. The opening chords in Eroica can be, and have been, played many different ways, from short to long to bright to deep, at different tempos and even with different pitches, if you include historical recordings. This last project, in particular, drives the point home that everyone has an opinion, they’re all different, and maybe that’s actually part of the fun. So this is mine. Yes, the Eroica ushered in a new symphonic era. It was unique, and revolutionary. It threw off shackles, and Prometheus became unbound. But it didn’t completely lose touch with its classical roots, either. Underneath the unexpected chord changes and rich orchestrations, there is still a framework that connects it with Mozart, Haydn, and those who came before. There is still room for lightness, even delicacy, in the Eroica. There are always going to be the myths, and there is always going to be someone who comes along and points out that it is really more complicated. Than that. Karen - I thought your latest was fascinating. I have never played the Eroica, unfortunately, but I think it is a wonderfully revolutionary piece. I would love to have the opportunity. You are fortunate to have played it three times, in different roles, with different orchestras under conductors with (presumably) different ideas about it and of the mechanics of how it should be played by violins. It will be interesting to see after the latest foray how you evaluate the three different experiences with it, particularly in light of your different roles. Thanks for including the link to the issue of Beethoven's motivations and thoughts re Napoleon. I had no idea about the financial angle. I had always heard that the reason was his crowning as emperor. Most people, I think, easily accept the latter because Napoleon gets such bad press from history and those who write it. One thing many people have difficulty getting their minds around is that for those of us who are Jewish, Napoleon is a major hero. His took the French Civil Code with its equality for Jews with him, and his conquests produced emancipation for Jews in a number of countries. In Italy, he personally accompanied his troops to order them to demolish the ghetto walls in places like Venice. While he did some things that the Jews did not like so much, his defeat was a disaster for them, leading to re-ghettoization in a number of countries. So, anyone who wanted to dedicate a symphony to him, that's fine with us. Hi Tom, Thanks for your comment! I didn't know that Napoleon had been so good to the Jewish people. You're right, history tends to portray him in an unfavorable and unforgiving light. I often have a hard time squaring how I feel about Beethoven's music with what I learn about him as a person. He had such a difficult life, but he also seems to have been rather difficult to get along with. I think there's a corresponding elevation of him going on in history. It's very romantic to portray him as having had republican sympathies and to have performed such a grand gesture. I found the chord sequence video to be very interesting too. So many tempos and even pitches. My favorite is something with longer chords and a moderate tempo, nothing too extreme. I had a similar feeling of initiation recently when I sat in with another orchestra (not my regular one) that needed more violas at the last minute. In our case, though, it was Mahler's Symphony No. 1. A couple of people I've talked to since - including my own teacher - seem duly impressed that I had the courage to tackle it, especially since I only attended the last two rehearsals. So I suppose I've arrived, in a way. As for that T that wants to creep into Eroica, it also occurred to Peter Schickele, to whose fictional character PDQ Bach he attributes the "Erotica Variations for Banned Instruments and Piano". Hi, Karen. I was actually going to comment on your "Viola to Cherish" blog, but couldn't find it with its "Submit comment" button. At the time, I didn't have a reply, but since then I've had more experience with my own viola and reread your blog. I was especially taken by two of your comments: 1) that the viola was a new beginning and 2) it brought you back to the violin. That was my experience also, but in a different context. Because my plan is to play the viola in a group that I have been playing violin in, I feel that I have to learn techniques that I haven't had to use much, if at all, on the violin: playing by ear, harmonizing by ear, and possibly playing bass clef. (The group has cellists but only one other violist so no catering to the violist!) Even without those, I feel I've had to learn viola in a more thoughtful way than I learned violin. It made me feel like I was relearning the violin. And in return, I knew that everything I was learning on the viola could be brought back to the violin. It has caused me to practice the violin in a more thoughtful manner. I had heard that studying viola would improve my violin playing, but I'm not sure this is exactly what was meant by that statement. It was part of a blogfest on Word Press about a cherished object. I still can't really play by ear, or, especially, harmonize by ear, and viola didn't help much with that. I have played bass clef on the viola sometimes, to play duets with my cello-playing son. I don't do this as much anymore now that he's become more advanced and I can't keep up with my rudimentary bass clef-reading skills. One of the really interesting ways that viola helped me with the violin is that it made the idea of finger patterns more universal. On the C-string I now had a situation in which D, E, F, G was 1,2,3, 4 with a half step between 2 and 3 (in C major). That's also true for 3rd position on the A string, and then finally somehow I made the leap that you could also do the same pattern on the E-string in 6th position with your first finger on D, and with that, the interval, from D to G on the E string, became a lot easier for me to conceptualize and less scary. It started to free me a little bit from being limited to thinking about set positions. And I started to understand in a way I never had before, why people would say, "oh I stop thinking about positions way up there." All the finger/note patterns way up there have corresponding patterns down low on one of the other strings in an easier position (like first, second, or third). I don't know why it took me having to deal with a C-string to figure that out, but it did. Karen, when I referred to your viola blog, I think it was a meta-reference. You had a v.com blog in which you referred to your blogfest blog and I made a comment that I thought I would love your blogfest blog just based on its title. It sounds like you learned "afresh" from the viola in the same way I did--just taking a step back and learning the viola as a new instrument teaches you something "new" and then you come back to the violin and realize that it's true for the violin, too. I think I'm in double heaven.